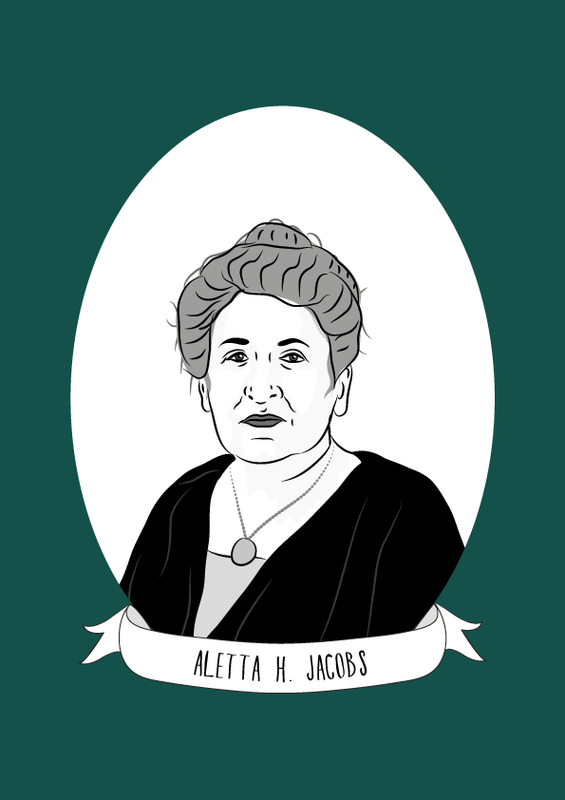 Aletta H. Jacobs was the first woman to officially attend a Dutch University and the first female physician in the Netherlands. She was also a women’s suffrage activist and inventor. Jacobs was born in 1854 in Sappemeer, Netherlands to Abraham Jacobs, a physician and Anna de Jongh. From an early age, Jacobs would accompany her father on his visits to patients and this inspired her to become a doctor. At the time, education for women in the Netherlands was uncommon and girls in Sappemeer were only able to attend primary school. At the age of 13, Jacobs left her village school and began briefly attending a ladies school. She left after two weeks and began studying French and German at home. Her father taught her Latin and Greek at home. Still determined to become a doctor, Jacobs was supported in her goal by family friends, one of which, Dr. L. Ali Cohen suggested that she become a pharmacist’s assistant in the interim. In 1869, the first woman passed the admission examination and in 1870 Jacobs followed suit. After some persistence, Jacobs was allowed to attend classes at Groningen University for a year, after which she received letters of permission from the liberal minister J.R. Thorbecke that led to Dr. S.S. Rosenstein, rector of the University of Groningen to allow her admission to the faculty of medicine. Jacobs graduated in 1879, becoming the first woman physician in the Netherlands. During her time at University, Jacobs became interested in social justice, and outraged at laws that unfairly affected women, including the Dutch marriage laws. After graduating, Jacobs travelled to London as she had read in British women’s magazines that professors, doctors and students were sabotaging women’s attempts to study medicine there. Jacobs became involved with British feminists who advocated for birth control and women’s suffrage. Later that year, Jacobs returned to the Netherlands where she set up her own private practice as a doctor. Jacobs focused her efforts on women’s health, and, inspired by her time in London, she introduced the pessary (diaphragm) to her patients despite opposition from men. Although the invention of the diaphragm is credited to W.P.J. Mensinga, Jacobs helped to improve and perfect the design to make it more effective. She also held a free clinic for those who could not afford medical care two mornings a week, and campaigned to change the unhealthy working conditions of salesgirls. In 1883, Jacobs petitioned for the right to vote in the parliamentary elections, stating that she met all the legal criteria. She was rejected, and thus began the fight for women’s suffrage in the Netherlands. In 1887, the constitution was amended to specify “male” inhabitants of the Netherlands had the vote, making it clear that the fight for women’s suffrage would be an uphill battle. In 1899, Jacobs attended The International Council of Women’s meeting in London where she met inspirational feminist leaders like Susan B. Anthony. In 1902, she co-founded the International Women’s Suffrage Alliance and a year later, gave up her medical practice in order to devote herself to fighting for women’s suffrage. In 1906, Jacobs travelled through the Austro-Hungarian empire with the IWSA president Carrie Chapman Catt advocating for women’s suffrage. In 1908, she hosted a hugely successful IWSA conference in the Netherlands, after which Jacobs and Catt continued to travel to inspire, and encourage women to improve their situations. During their travels, Jacobs wrote reports of the trip for the Dutch paper De Telegraaf. In addition to these articles, Jacobs also enabled women in the Netherlands to access feminist social economic theory by translating Charlotte Perkins Gilman’s Women and Economics (1900), and Olive Schreiner’s Women and Labor (1910). After the outbreak of World War II in 1914, Jacobs used her international network to campaign for peace. She organised an international women’s conference at the Hague led by American reformer Jane Addams. Jacobs then travelled through war-torn Europe, meeting with leaders to encourage mediation including President Woodrow Wilson of the United States. Jacobs did not give up her campaign for women’s suffrage during the war, and in 1919, women in Netherlands were finally granted the right to vote. That same year, Jacobs and others from the Hague conference founded the Women’s International League for Peace and Freedom. She continued to speak at conferences and fight for the rights of women until her death in 1929. In 1990, the University of Groningen honoured Jacobs when they etsablished the Aletta Jacobs biannual prize. The prize is awarded to women who have distinguished themselves in the field of emancipation. Sources here, here, here and here.